Ant Antics | Mrs. Anton's Class! I hope you have had a chance to look at Tumblebooks! We have used it almost every day. 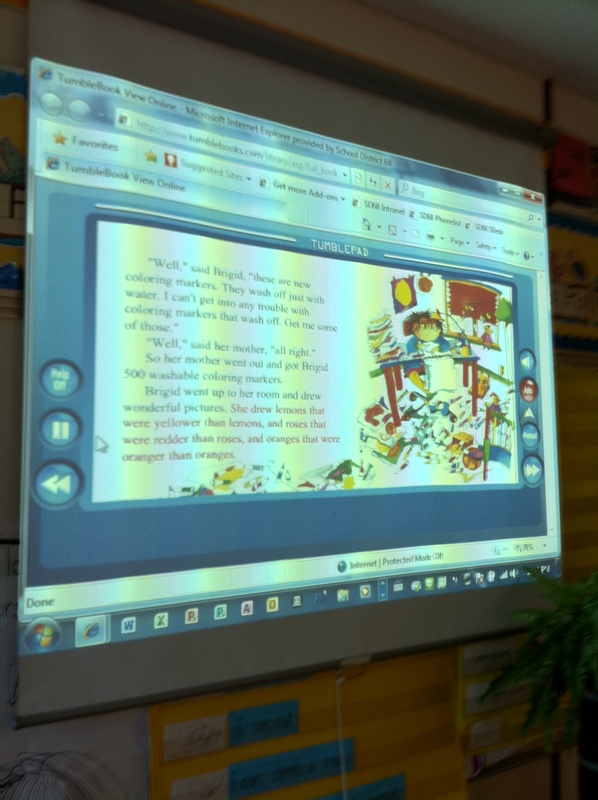 The children loved the Purple Yellow Green story that I read by Robert Munsch and asked if it was on Tumble books too. Luckily for us it was! This is a screen shot of our screen! Last Friday we learned about ants! Ants are one of my favourite insects. Can you guess why? We read a few nonfiction books about ants and tried to make a list of some of the different kinds of ants. I have to admit I learned about a few new ones today. For instance, did you know that there is an exploding ant. Seriously, there is an ant the explodes when it senses that its colony is in danger! There is a pink-faced green ant too! The children thought that the honeypot ant was hilarious. 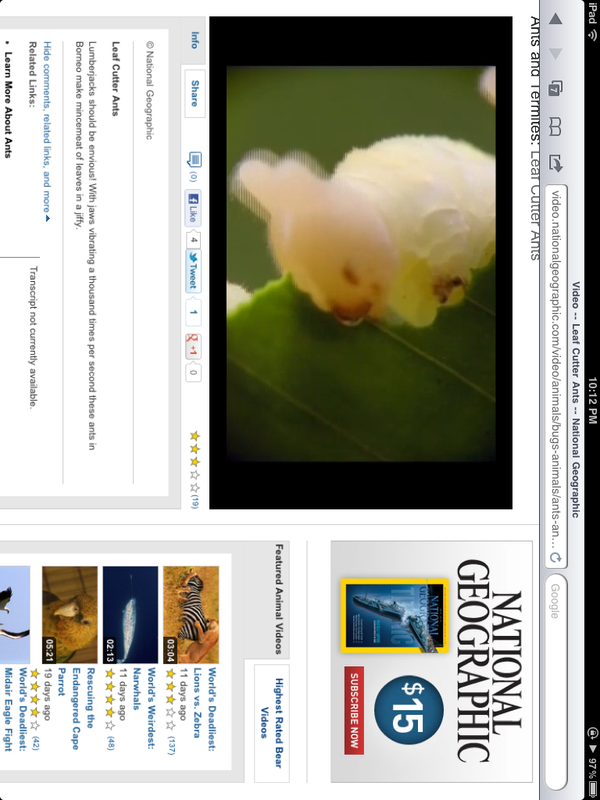 I was checking on the species names when the children were at music and found some awesome videos of fire ants and leaf-cutter ants on the National Geographic Site. It was really neat to be able to share this with the children so easily today. Without the new equipment this would have been very tricky… but with the touch of a button I had pictures and videos of real ants. Take a look! 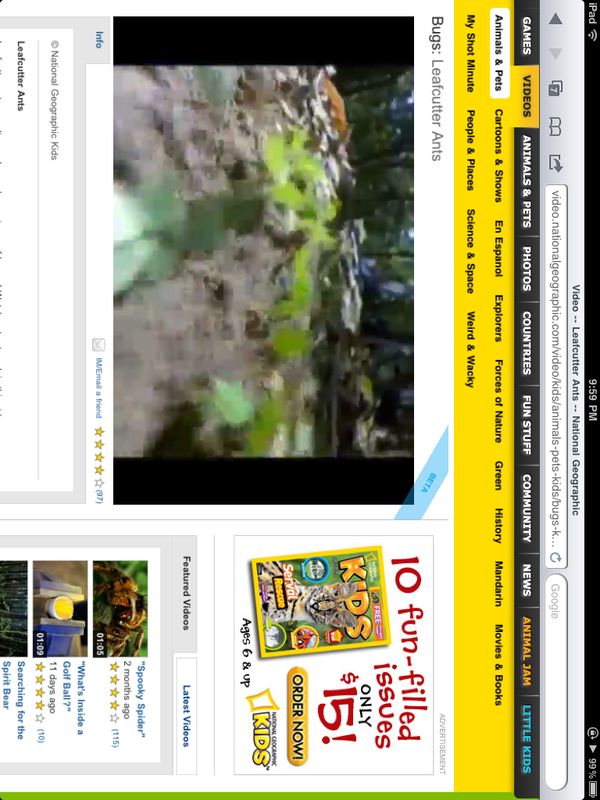 Just search the National Geographic Kids website for the leaf cutter ants video. Here are some screen shots of the video site. I love the way the leaf-cutter ants scurry along! My favourite part of the video is the sight of all those caterpillars chewing on the same leaf! Here is just one of them!